Chinese dragons are legendary creatures in Chinese mythology and folklore, with mythic counterparts among Japanese, Korean, Vietnamese, Bhutanese, Western and Turkic dragons. In Chinese art, dragons are typically portrayed as long, scaled, serpentine creatures with four legs. They traditionally symbolize potent and auspicious powers, particularly control over water, rainfall, and floods. In yin and yang terminology, a dragon is yang (male) and complements a yin (female) fenghuang "Chinese phoenix". The dragon is sometimes used in the West as a national emblem of China. However, this usage within both the People's Republic of China and the Republic of China (Taiwan) as the symbol of nation is not common. Instead, it is generally used as the symbol of culture. The dragon is also a symbol of power, strength, and good luck. In Chinese culture the number nine is lucky. If you look closely at a Chinese dragon picture, you will notice that there are generally attributes that number nine or a multiple or divisor of the number. One example is that the scales often consist of eighty-one male and thirty-six female. They also have nine attributes and nine mythical sons. In Chinese culture there are also nine varieties of dragon. These are: the Celestial Dragon, the Spiritual Dragon, the Dragon of Hidden Treasures, the Underground Dragon, the Winged Dragon, the Horned Dragon, the Coiling Dragon who lives in the waters, the Yellow Dragon who came from the River Luo to teach another mythical creature how to write, and of course the Dragon King. Nobody really knows where the dragon comes from. The dragon looks like a combination of many animals. For the Chinese people, Dragons were described visually as a composite of parts from nine animals: The horns of a deer; the head of a camel; the eyes of a devil; the neck of a snake; the abdomen of a large cockerel; the scales of a carp; the claws of an eagle; the paws of a tiger; and the ears of an ox. The Chinese word for Dragon is spelled out in roman characters as either lung or long. In China, the Dragon was credited with having great powers that allowed them to make rain and to control floods (by striking the river with its tail, causing it to open and thus divert the floodwaters) also Dragons are credited for transportation of humans to the celestial realms after death. They are symbols of the natural world, adaptability, and transformation. When two dragons are placed together but turned away, they symbolize eternity via the famous Yin-Yang. 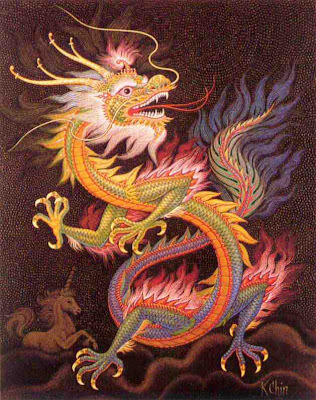 Chinese emperors think they were the real dragons and the sons of heaven. Thus the beds they slept on were called the dragon beds, the throne called the dragon seat, and the emperor's ceremonial dresses called dragon robes.